SRae Productions and 4Wall Nashville Light Jill Scott’s 2017 Summer Tour | Press Center | 4Wall Entertainment, Inc.
Nashville, TN- Three-time Grammy award winning artist Jill Scott kicked off her 25-city summer tour in June. 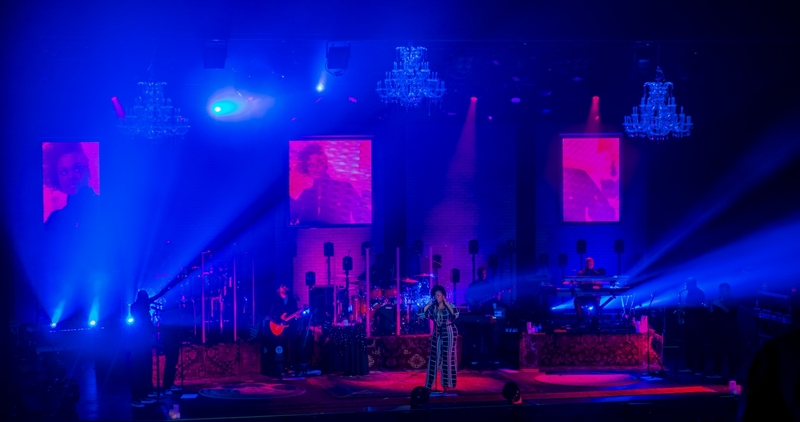 Designers Sooner Routhier and Robert Long of SRae Productions were tasked with creating a lighting design for the singer-songwriter with gear provided by 4Wall Nashville. Before Routhier and Long could create a lighting design, the scenic elements for the tour needed to be in place. Scott requested to see brick walls and chandeliers in a theatrical setting for her tour. "We needed to come up with a solution that would deploy quickly and still provide some sort of background for her and the band," said Routhier. "Once that was figured out, we needed to light it." Scott had a keen awareness to color during rehearsals with her band. "You can often hear her tell her band that she needs to hear more 'orange' or 'blue'," explained Routhier. "It's important to listen to her speaking with the band members and make the changes to the color palette as they play." 4Wall provided Chroma-Q Color Force II LED battens to uplight the brick walls. The fixture's dual-focus lenses were invaluable to the lighting crew on tour. "The Color Force IIs did an excellent job of casting a nice even wash from the bottom to the top of whatever they are lighting," said the Director and Associate Designer Aaron Luke. "We also had to get more creative and use them on curved planes―this is where the lenses really prove to be so great." Luke continued, "Rather than have a hotspot in one part of the plane, we are able to situate the fixtures in such a way that keeps a nice even wash."
4Wall also provided Martin MAC Auras which were used to sling beams across the surface from below. An asymmetrical pattern of Ayrton MagicDots on pipe behind the band were used as effect and visibility lighting to the music. Robe Robin Pointes blasted gobos and beams through the band while Martin MAC Quantum Washes washed the band from the side and boosted the chandeliers from below with color. The tour wrapped up this month with a final show at the Perchanga Theatre Resort & Casino in Temecula, CA. Both Lighting Designers were satisfied with the gear and service provided by 4Wall Nashville. "Everyone from 4Wall was very thorough and helpful with all aspects from initial bids to support on the road," said Routhier. LD Luke echoed Routhier's remarks. "The service was phenomenal. Having multiple offices around North America has proved very helpful and convenient. From picking up extra hazer fluid to swapping out a fixture, 4Wall has had our back." To see more work from designers Sooner Routhier and Robert Long, visit their website here. To see more work from LD Aaron Luke, visit his website here.